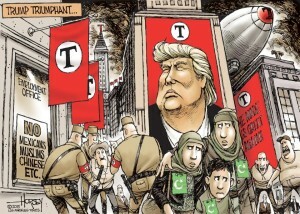 David Horsey’s dystopian vision of life in America under Donald Trump (right) has become a shocking reality. With Trump’s Deportation Force rounding up immigrant familiess from Latin America and jailing them in internment camps, and Trump asserting dictatorial powers over the courts and constitutional due process, today the conservative majority on the U.S. Supreme Court upheld Trump’s Muslim Travel Ban in a 5-4 decision in Trump v. Hawaii(.pdf). This is what creeping fascism looks like. The conservative majority on the Court demonstrates exceeding deference to executive authority, and exceeding indifference for individual liberties. Chief Justice John Roberts, delivered the opinion of the Court, in which Kennedy, Thomas, Alito, and Gorsuch joined. Kennedy and Thomas filed concurring opinions. Effectively the conservative majority holds that as long as there is a minimally rational neutral (pretextual) reason for the action taken under the Immigration and Naturalization Act, the Court will accept that reason as reasonable and disregard other evidence of the president’s numerous and repeated discriminatory public statements exhibiting a discriminatory animus. So Trump can be a raging racist religious bigot against Muslims to his heart’s content, and it does not affect the validity of this immigration order so long as the government can provide a minimally rational (pretextual) reason for the order. One has to pose the hypothetical question whether this decision would be the same if this was a travel ban on Christians from predominantly Christian countries, instead of Muslims from predominantly Muslim countries. Sadly, I think we all know that we can presume the answer is no, and that is why this is a suspect opinion. To their shame, all of the justices ruling in favor of the Muslim Travel Ban are Catholics. Given the past history of the Church, I’m sure Pope Francis is most displeased with the bad optics. In an opinion by Chief Justice John Roberts, the majority relied on the national security justifications for the ruling, while Justice Sonia Sotomayor, in dissent, lamented that the court had “blindly” endorsed “a discriminatory policy motivated by animosity toward” Muslims. The majority similarly rejected Hawaii’s contention that the September 2017 order violates another provision of federal immigration law, Section 1152(a)(1)(A), which bars discrimination based on nationality in issuing visas. Section 1182(f), Roberts observed, “defines the universe” of noncitizens who can get a visa to come to the United States; Section 1152(a)(1)(A) then prohibits discrimination based on nationality in granting or denying visas to those noncitizens. But Section 1152(a)(1)(A) does not, Roberts stressed, limit the president’s ability to block the entry of nationals of some countries. Indeed, he noted, other presidents have done exactly that: President Ronald Reagan suspended the immigration of Cuban nationals to the United States, while President Jimmy Carter issued an order denying visas to Iranian nationals. But Hawaii’s argument, Roberts wrote, would mean that both of those orders would violate the law. “Nor would the President be permitted to suspend entry from particular foreign states in response to an epidemic confined to a single region, or a verified terrorist threat involving nationals of a specific foreign nation, or even if the United States were on the brink of war,” Roberts pointed out. Roberts began with what seemed like a subtle rebuke of the president, observing that the president “possesses an extraordinary power to speak to his fellow citizens and on their behalf.” He recounted stories of other presidents speaking out on the need for the United States to protect all religions, from George Washington telling a Hebrew congregation that the government “gives to bigotry no sanction” to Dwight Eisenhower assuring the audience at the opening of an Islamic center that “America would fight with her whole strength for your right to have here your own church.” “Yet it cannot be denied,” Roberts acknowledged, that the federal government and other presidents have “performed unevenly in living up to those inspiring words.” But the question before the Supreme Court, Roberts emphasized, is what role those statements should play in determining the constitutionality of the September 2017 order. Justice Stephen Breyer filed a dissenting opinion, which was joined by Justice Elena Kagan. In particular, Breyer focused on the exemption and waiver programs on which the majority partly relied to uphold the order. If the government is applying those programs as they are written, he posited, then the order is more likely to be legitimate – including because the programs “would help make clear” that the September 2017 order is not targeting Muslims, by allowing them to come to the United States when it is clear that they do not pose a security risk. But Breyer cited evidence suggesting that the exemption and waiver programs are not in practice providing any actual relief from the order, including an affidavit from a U.S. consular official describing the waiver process as “window dressing” and averring that he and others like him do not have the discretion to grant waivers. Because no court has had a full opportunity to consider this issue, Breyer would send the case back to the trial court for further development, and he would keep the order on hold until the issue is resolved. Today has been a bad day for democracy. SCOTUS is a real problem, thanks to Mitch McConnell. How in the blazing hell he got away with stealing a SCOTUS appointment from President Obama is beyond me. The Democrats should have been raising all kinds of hell. Mitch McConnell deserves life without parole, IMO, for what he has done to this country. (I just wrote two paragraphs that I had to delete).